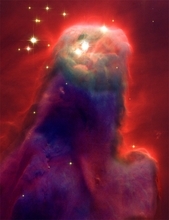 Scientists at NASA see cones, pillars, and majestic flowing shapes abounding in stellar nurseries where natal clouds of gas and dust are buffeted by energetic winds from newborn stars. "And when he had spoken these things, while they beheld, he was taken up; and a cloud received him out of their sight. See this image without the overlay of the face of Jesus, as captured by the Hubble.